Reading all the blogs yesterday and our comments, I agree that we are all probably ok-ish at colouring in and evem though we can strive for perfection, we should be happy with our work during that road to perfection. I will definitely try my best and take on that advise. Maybe that means I will colour more often, and in that process I will become better! 3 of my best craft projects? Well, I won a Joanna Sheen competition once with a card similar to the one I posted the other day with the chocolates in it - so I guess that goes on the list. To be honest though I liked my Christmas cards with the same design but different motifs much better. My number two might be a card I made with a 3D champagne bottle for a golden wedding anniversary. It was beautifully decorated with flowers and personalised. I alsp made a matching box for it also decorated with flowers. I was pleased with how it turned out. My third could be a number of things, it could be cards, boxes, books, candles. Well, lets go with the candle I made for my nephew's girlfriend last Christmas. I got a photo of both of them and put it on a white candle, then decoated the bottom of the candle. She was really pleased with it. So thats it, folks! Now onto todays white card. It's the first time I have made an all-white card (well except for the greeting as otherwise you wouldn't be able to read it!) but it is not the last time. It was fun to make an all-white card and challenging as I had to make texture instead of colour do the talking. 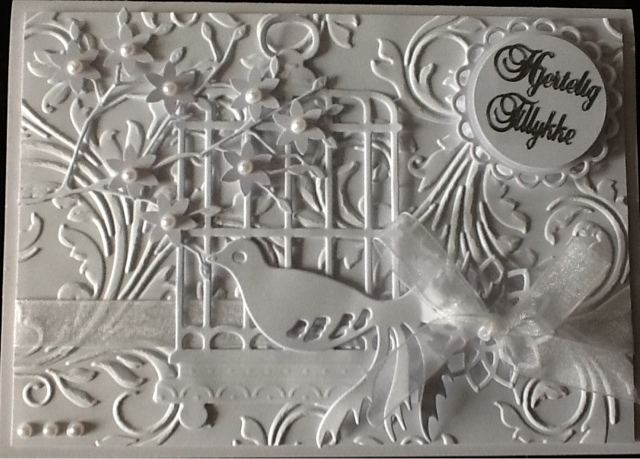 I embossed a sheet of white card with a Crafters Companion 8" embossing folder. I cut a little ribbon decoration - Memory die - and wrapped around a white ribbon before adding the embossed card to my card blank. I then die cut the birdcage and bird - both Marianne dies - and added them to the card. I finished with the branch - also Memory die - where I added some punched flowers decorated with white flatbacked pearls. 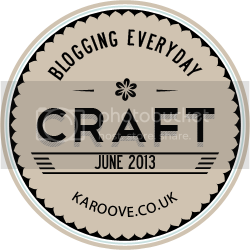 I finished with the greeting, the scallopped oval is a Spellbinder die and the round on top is a punch. Yes, they are very sophosticated indeed. Actually it turned out nicer than I thought it would on the photo. Next time I may have a less prominent background though - maybe a small dotted background.